This is perhaps the most basic of all tools available. These were carried everywhere by pioneers for hunting, woodcarving, or to use in meal preparation like we do today. However, in today’s world, we have ten different kinds of knives to do each little task, whereas the pioneers took more of a one-size fits all approach. Although knives could be used for small pieces of wood, saws were needed for any larger, thicker logs. Typically, pioneers required two saws: a large bow saw for trimming trees and a smaller hand-held saw for more precise work. In a way, the ax takes the best of both worlds from the knife and hammer. It has the powerful force of a hammer, but the sharp blade of a knife. 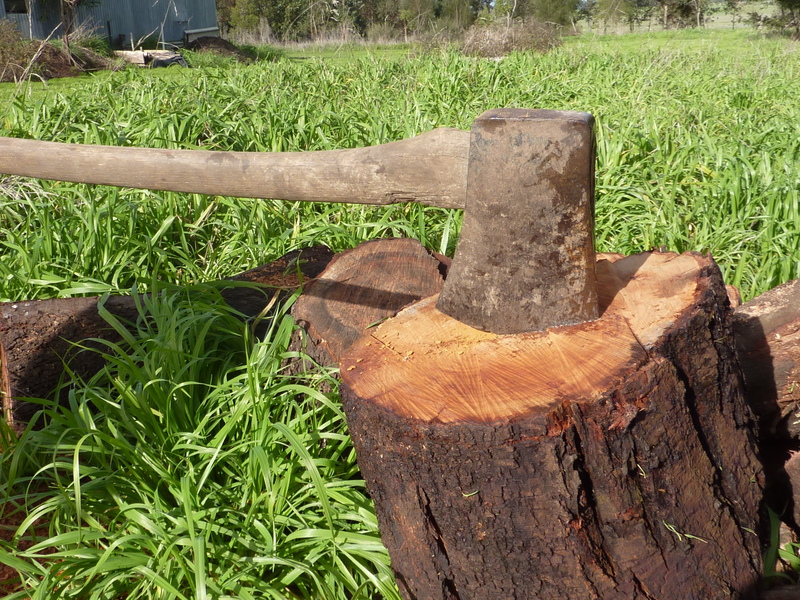 In the pioneer days, axes were used to chop firewood, clear the land for farming, and building new cabins. In order to farm, pioneers needed a plow to loosen and turn over layers of soil. Smaller plots could be handled with a spade, however large areas needed a plow. Because it was difficult to travel with a plow, many pioneers had to resort to building their own from local timber. Pioneers did not have access to the chemical weed killers that we use today, so they were forced to use a hoe to clear out their land and successfully produce crops. Hoes were used to chop foliage away right at the root without having to bend down in an uncomfortable position. Flails were needed to separate grain from husks after it had been harvested. Basically, this tool is two sticks brought together with a short chain. Pioneers used to pile up the grain and hit it with the flail until the husks were removed. Doing so is very labor intensive, however it is much quicker than removing husks by hand. Looking back at all of these tools that the pioneers used, they seem outdated and ridiculous compared to the power tools of today. However, unlike power tools that can easily break or malfunction, these tools were sturdy and reliable. If there were issues, they could easily be repaired and ready for use within a matter of minutes. If society were to collapse, having these tools handy would be your best chance for survival.